A little over a week ago, I sat in a cavernous pier warehouse listening to an ex-CIA interrogator at the Sydney Writers Festival. I went to the Chaser’s Empty Vessel, a kind of live chat show before a live festival audience, at the last minute. I had not expected the interrogator. The camaraderie shared by those on stage on the subject of torture – such as the jest about whether the music blaring for 16 hours before cutting to deafening silence was Barney the Dinosaur – was stomach-turning. 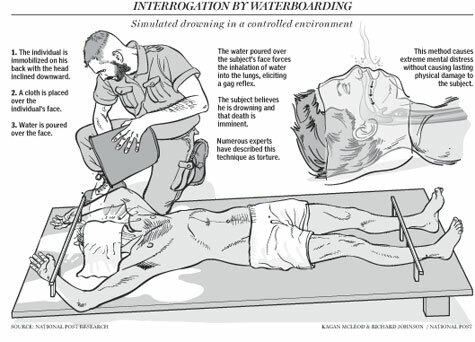 ‘Enhanced interrogation techniques’: to distinguish between the way the CIA used to interrogate, and the new, improved way. Carle explained that the military didn’t offer the two years specialised training the CIA did – ‘We were taught how to torture people, but only because one day it might be used on us’ – which was why we saw the atrocities we did at Abu Ghraib. He also explained that it wasn’t that the CIA were bad folk or a bad agency, it was just that they’d lost their way a little. ‘Shame,’ a lone audience member called from the other side of the room when Carle began to detail the techniques of torture he had witnessed. ‘It’s not his fault,’ replied one of the Chaser crew. What did it mean, I wondered, that you could be accused of inflicting merciless violence on another individual’s mind and body, but what really gets you is being thought of as a ‘career failure’? But more than that, I wondered what had changed about us, the audience, that we could sit there listening to these descriptions of torture, laughing in all the right places. We used to be outraged by the CIA’s training of death squads, by its trail of destruction in Central America, South America, Africa, by the Phoenix Program in Vietnam. By El Salvador, where close to 100 000 people were killed or disappeared in the 70s and early 80s. Later in Salvador, Joan Didion writes that the perpetrators of the Mozote Massacre (above) were ‘trained by American advisers’. Journalist Allan Nairn revealed that the CIA trained the Salvadoran death squads in the use of interrogation and torture, and supplied security forces with various forms of surveillance for thousands of dissidents who went on to be murdered. Seven years ago, the US announced they were establishing assassination squads in Iraq to target Sunni rebels; it’s appellation: ‘The Salvador Option.’ Nairn observed that on the one hand it was a perverse joke, but on the other, at least the US was finally admitting its involvement. we no longer have wars in the old sense of a conflict between sovereign states in which certain rules apply (to do with the treatment of prisoners, the prohibition of certain weapons etc). Two types of conflict remain: struggles between groups of homo sacer – ‘ethnic-religious conflicts’ which violate the rules of universal human rights, do not count as wars proper, and call for a ‘humanitarian pacifist’ intervention on the part of the Western powers – and direct attacks on the US or other representatives of the new global order, in which case, again, we do not have wars proper, but merely ‘unlawful combatants’ resisting the forces of universal order. In this second case, one cannot even imagine a neutral humanitarian organisation like the Red Cross mediating between the warring parties, organising an exchange of prisoners and so on, because one side in the conflict – the US-dominated global force – has already assumed the role of the Red Cross, in that it does not perceive itself as one of the warring sides, but as a mediating agent of peace and global order, crushing rebellion and, simultaneously, providing humanitarian aid to the ‘local population’. In other words, these glimpses of torture spied on the public landscape are not isolated, aberrant incidences. They are the cost of the War on Terror: a war that has no logical endpoint, but one in which we give our governments and intelligence agencies carte blanche. One of the major differences the War on Terror has made to the CIA is that they can now publicise that which they used to hide, such as creating death squads in Iraq. George Tenet asked if he had permission to use enhanced interrogation techniques, including waterboarding, on Khalid Sheikh Mohammed … ‘Damn right,’ I said. 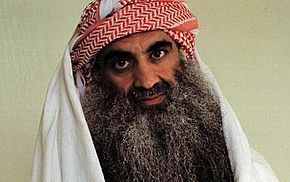 Khalid Sheikh Mohammed, said to be the ‘architect’ of the attacks on the World Trade Centre, was waterboarded – a mock execution in which the victim experiences the sensation of drowning – 183 times in one month. People might dismiss Sheridan for his apple pie and cup of tea jibe, but might they not agree that Khalid Sheikh Mohammed has forsaken some of his human rights, particularly if it meant preventing a future attack? The past decade has not only legitimised torture as a distasteful necessity, it’s also hardened us to what that necessity actually means – that there are human beings on the end of those techniques. That after an hour of lying prostrate, cloth covering their face, water rushing through their airways, believing they might die, most people would confess to anything, even the Sharon Tate murders. Words matter. If our largest newspapers had referred to waterboarding by its proper name, as they did in the decades leading up to the Bush years, we might be having a more honest discussion today about issues such as Guantánamo, the wars in Iraq and Afghanistan, and the ongoing fight against terrorism. This same insidious tolerance can be observed creeping into domestic policing as well. It is now standard to call in the riot police at the first sign of protest – including at a community rally to save fig trees! Police can ride their horses into crowds, pepper spray and beat demonstrators, and days later the outrage has all but disappeared. The hard-line response has become so routine that we expect it for any Occupy rally, any student demonstration, any community action. If Carle really wanted to see the CIA cessation of torture, if he wanted to expose the Sisyphean War on Terror, he would have blown that whistle hanging around his neck. Instead, whole sections of his book were redacted, and he ran everything past the CIA censors. So what exactly did it cost Carle to write this expose? ps. 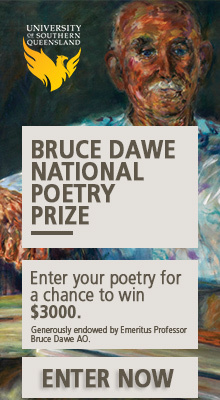 If you want to see a meaningfully symbolic act of people turned by their experiences of the War on Terror, try this. Thanks Jacinda for thoughtful yet disturbing post. The attitude of the audience at that segment of the Sydney Writer’s Festival is quite chilling. Especially as I recall at the time that most decent people found the US involvement with Central American death squads as abhorrent and only the most fanatical Rightist would consider it ‘the price of freedom’. I’m also glad you made the link with recent policing of demonstrations in the West. 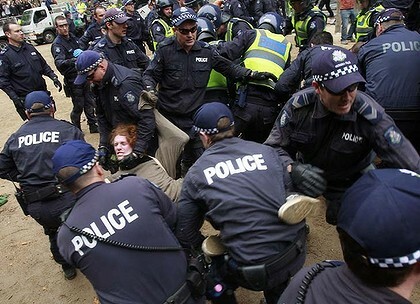 The level of force employed as a first resort in smashing Occupy Melbourne was something that surprised me and that I had not seen before at a what seemed like a fairly placid, static demonstration. Really brilliant piece, Jacinda, from beginning to end. Thanks. Bravo – a really fine piece – I want to cheer! Thanks Stephen and Ann, much appreciated. Reminds me for some unheimlich reason of the ending to Soylent Green, the 1973 film signposting a dystopian future (2022) suffering from pollution, overpopulation, depleted resources, poverty, dying oceans, and a hot climate due to the greenhouse effect, with only torture missing, although the final scene does have blood streaming from Thorn’s nose as he prosecutes his case: “Soylent Green is people!! !” (Another version of “The horror! The horror!”). Whether in our distanciation fixation we laugh with indifference or profess moral outrage the unjust image remains that – unjust. Just as the unheimlich thing about the unheimlich is that absolutely anything can be unheimlich. Where is the revolutionary political imaginary in the event of all this torture and suffering – injustice becoming symbolic; the real remaining unjust and intractable as ever and always? Thanks for the comments Dennis – I think. Though, unless I’ve misunderstood you, you’re saying this post makes the reader choke, and that writing like this makes little difference other than in venting moral outrage? Is that what you meant? I guess I just wanted to point out how normalised torture is now. It’s not that anybody in the audience was necessarily an advocate for torture – something I think that was quite obvious on the Q&A panel Carle appeared on as well (Sheridan being the exception) – but we accept that it happens. President Obama believes that, done carefully, deliberately and responsibly, we can be more transparent and still ensure our nation’s security. So let me say it as simply as I can. Yes, in full accordance with the law, and in order to prevent terrorist attacks on the United States and to save American lives, the United States government conducts targeted strikes against specific al-Qaeda terrorists, sometimes using remotely piloted aircraft often referred to publicly as drones. And I’m here today because President Obama has instructed us to be more open with the American people about these efforts. And now there’s this lengthy NYT piece about how Obama personally and seriously weighs each potential assassination target. Almost as though they think it’s not the acts citizens will object to, but the secrecy around it: if only things were out in the open … Actually, I have no idea where the logic goes from there. No, not at all. I’m as implicated as anbody else. Simply asking the question – as I might have done on any blog: this seemed particularly worthwhile – when and where change might come and from? The unheimlich in Jacinda’s post comes from the juxtapositions she has deftly put together – the weird atmosphere of jokes in the Carle presentation, the use of drones, openly and transparently in the cause of ‘justice,’ drones that might be dropping food parcels or Hellfire missiles. There is no ‘logic’ as such here. And often trying to make the logic painfully morally obvious doesn’t help. It’s throwing the weird horror into some kind of relief that’s difficult, because as Jacinda points out, it’s become normalised. That’s why Obama can be ‘open and transparent’ about dropping Hellfires on sleeping civilians. It has become normal and that is what is so very very disturbing. As for revolutionary change in the political imaginary – if you sit alone in a room with a psychopath, just keeping your mind straight, being very disturbed but being able to tolerate that can be a huge achievement and immensely transformative. I really liked this post because that’s what it did: kept its head and was very disturbed at the same time and showed us why we should be disturbed. Yes. The disturbing thing is that we know the soylent green is people, and we’re eating it anyway. Thanks for making the connections, Stephen. No need to go too hard. We know the soylent green is people and we continue to eat it without doing anything about it. So the question needs asking from time to time.